Who will ever forget September 11, 2001.
Who will ever forget just where they were the moment they heard two planes had been flown into the World Trade Center towers that sunny morning in New Work City? Who will ever forget hearing Peter Jennings and the many other news anchors stumble as they tried to put words to what they were witnessing? Who will every forget seeing the people waving flags for help from the huge, smoky gash in the top of the towers? Who will ever forget seeing people throw themselves out of the building as the pain of the heat behind them out weighed the fear of such a horrific death in front of them? Who will ever forget later hearing the sounds captured on video of those bodies hitting the ground with huge thuds documented on various cameras? Who will ever forget seeing the pale, fear stricken faces covered in soot running through the streets of New York City moments after the buildings collapsed? Who will ever forget the fear the country was in at the moment or the shocked, angry look on the face of President Bush as he was told by an aide? Who will ever forget seeing the many different home videos of the planes being flown into the buildings? Who will ever forget the crumbling collapse of the two largest buildings in the world? Who will ever forget seeing the hundreds of NYPD, FDNY and Port Authority Agents running into the building prepared to save lives with most of them giving their own? Who will ever forget hearing rumors that another plane was headed to the White House, hearing another had hit the Pentagon and hearing another had just gone down in a field in Pennsylvania? Who will ever forget later hearing the heroic stories of those on Flight 93 and those who helped rescue those at the Pentagon? Who will ever forget all airplanes being grounded for the first time in American history? Who will ever forget watching the news for hours every night, for weeks as rescuers searched the rubble for survivors or bodies? Who will ever forget knowing the over 3000 had their lives taken that day?Who will ever forget knowing terrorist, Bin Laden, and his evil, weak, coward group was behind these attacks on America? Who will ever forget the patriotic resolve America had those few weeks following this tragic event? Who will ever forget the sadness and anger we all felt? The thinking the “end” might be near? Who will ever forget hearing the horrible, sad 911 phones calls released to us just weeks ago from people in the towers who moments later died? Who will ever forget all of this? Many Americans will. That’s who. According to Neilson ratings, 21 million Americans chose to watch the “Manning Bowl” Sunday night between the NFL’s New York Giants and Indianapolis Colts rather than the other 9/11 options being shown on ABC or CBS. Just like that, just five years later, the country has returned to what it new before that terrible day – patriotic divide, anti-war protests, corporate sandals, a general “who needs God” mentality, immoral activities, Hollywood drama, and sports fanaticism. America is a great land. It’s a country that offers various pleasures and exciting adventures to help us deal with things like 9/11. Sports are great. Movies are fun. Politics are the American way. But more importantly, being an American offers each of us with the freedom to seek God in times such as this. A chance to seek the One who can set us free from ourselves and the evil acts of people like those who made this such a terrible day five years ago. Six years ago, people were seeking Him like never before. Churches were packed, prayers were said and people were begging for help. We were all seemingly frozen in time and space. The panic and fear people were experiencing was driving them to God. His arms open wide waiting to embrace them. He has been waiting along time. God gave us our freedom in Christ 2000 years ago and for some it wasn’t until this terrible day that many began seeking Him like never before. But freedom has a price. And now that many have moved on and would rather forget this day happened, it seems many have also forgotten just how big the price paid was on 9/11/2001. And, they have forgotten God right along with it. 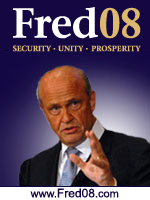 Fred Thompson announced his bid for President last night on Jay Leno. The GOP needs a man of the people and a shot in the arm and he can do it. Read his “Reaganism” beliefs on his new site. Finally, a real man that actually sounds, acts and looks like a President is on the scene. Let’s be honest, a President has to be a good actor. Reagan surely was and Clinton, well, he had to. Poor President Bush, love the man, but he just needs to stick to business when he is done. Just ask yourself this, the next time there is a terror attack on U.S .soil (and don’t be fooled cause one is likely to happen), who do you want standing in front of us saying, “My fellow Americans….” Hillary? Obama? McCain? Romney?